Apple's 8-Pin Lightning Male to Female Adapter / Extender for iPhones / iPad Pro, Mini, Air / iPods EXTENSION DOCK EXTENDER ADAPTER FOR Apple IPHONE 5SE 6s Plus iPhone 7 PLUS IPAD Air / iPar Pro CASE [AP003730] - $4.95 : allputer.com - Accessories for all your Portable Electronics & Computers! If your iPhone / iPod / iPad is wearing a case (say, a waterproof case), how you could adapt them to other funny accessories, e.g. Remote Control, Cradle, Charge Station, Audio Dock, Music Dock, Car Windshield Mount or even external charger...? How you can overcome such situations? 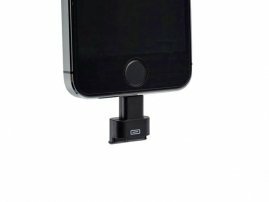 We have an innovative product for you, just have this connector on, then you will have all the flexibility to attach your iPhone / iPod / iPad with any other accessories. - Extra Long in Male Side allows for use with various cases with a stable, secure connection to accessories. - Provides a compact extension to your Apple products, fits all protective cases covers(Case Compatible), or skin on the planet. - Dock with most dock accessory without removing your case. - This is an OEM product. - Not for 30-pin audio docks (iPhone 4s / iPad 3 / iPod Touch 4 / iPad Nano 5). If you need it for these devices, you will need to buy a 30pin dock extender male to female cable or adapter. - This is a Female Lightning to Male Lightning adapter.